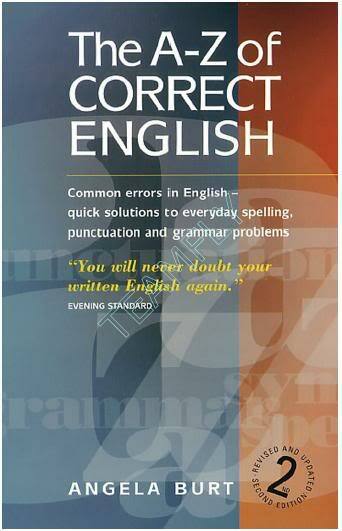 The A–Z of Correct English is a reference book which has been written for the student and the general reader. It aims to tackle the basic questions about spelling, punctuation, grammar and word usage that the student and the general reader are likely to ask. Throughout the book there are clear explanations, and exemplar sentences where they are needed. When it’s helpful to draw attention to spelling rules and patterns, these are given so that the reader is further empowered to deal with hundreds of related words. The aim always has been to make the reader more con?dent and increasingly self-reliant. This is a fast-track reference book. It is not a dictionary although, like a dictionary, it is arranged alphabetically. It concentrates on problem areas; it anticipates di?culties; it invites cross-references. By exploring punctuation, for example, and paragraphing, it goes far beyond a dictionary’s terms of reference. It is not intended to replace a dictionary; it rather supplements it. Once, in an evening class, one of my adult students said, ‘If there’s a right way to spell a word, I want to know it.’ On another occasion, at the end of a punctuation session on possessive apostrophes, a college student said rather angrily, ‘Why wasn’t I told this years ago?’ This book has been written to answer all the questions that my students over the years have needed to ask. I hope all who now use it will have their questions answered also and enjoy the con?dence and the mastery that this will bring.